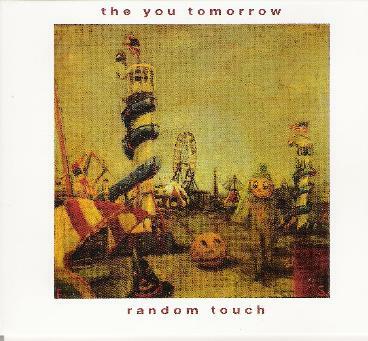 Random Touch - "The You Tomorrow" / "The Elegance of Falling"
After having not heard anything since A Parade of Dusty Hobos, it was definitely time for me to catch up with Random Touch and check out their last two releases. 2004's The You Tomorrow contains both a CD of new music and a DVD. If you've not experienced this group's music, well, let's say that Random Touch is the perfect name for them. Their music does indeed have the ability to touch you in totally random and unpredictable ways. This is fractured, sometimes spacey, sometimes chaotic, always deeply experimental stuff, created with an array of percussive, found and synthesized sounds. There's also much in the way of heavily processed vocals (both sung and spoken) floating through the mix like eerie ghosts. It's interesting how Random Touch, from album to album, tends to walk back and forth between urban and rural landscapes. The You Tomorrow is definitely one of their city albums. But this is the city underground, a soundscape of parking garages, hidden industry, abstractionists creating dark masterpieces in grey cement basements. It's the stuff of gritty, street nightmares, the rattle of a garbage can heard from a tiny, streetlight lit park, the angular confusion of urban decay, and heated arguments heard through tenement walls late into the night. Yet the percussiveness and vocal chanting nature of some of the pieces lends a kind of urban tribalism to the proceedings, a dark descriptor of how we define ourselves in this modern age. If this all sounds like an odd way to describe music, it probably is. But there is no other way to describe the sounds on a Random Touch disc. And I won't coddle you by saying this is easy stuff to listen to, either. It's not. But it never fails to mesmerize. One of the most remarkable tracks on the album, though, that I have to single out, is one that takes us above the city, into the star spinning night. The 13-minute Saturn and Sirius is a deep space expedition into a dark universe of rolling, clattering cymbals, metallic percussion, and eerie, distant voices. An extraordinary piece of music! It was definitely the highlight of the album for me. As mentioned, The You Tomorrow contains a DVD as well, chock full of goodies including video versions of 9 of the 17 tracks on the CD, as well as some videos of live performances in various venues. Now to be honest, this wasn't as big a selling point for me as the CD itself. I'm not a huge video fan, preferring to let the music fire my own imagination into creating images in my mind. I purposefully left watching this until I had already reviewed the CD portion of The You Tomorrow. So it was with kind of a surprise that I soon saw that most of the videos were shot in a rural or natural setting, as opposed to the images I had seen in my own mind's eye of dark city undergrounds. It brings to light the intriguing connections between the artist's mind and the artist's environment and the audience's perception. The videos, which looked as if they were shot with a hand held video recorder, were often random images edited together. The duo did appear themselves in a few of them though, most amusingly in You Define Single File, where they cavorted around in their lab coats, mad scientists mapping the genome of an imaginary species. Of more interest to me were the live performances, where we actually get to see the guys doing their thing. The first one, shot live at The Hothouse was a truly excellent piece, with throbbing percussion and spacey synths, leading to a dark and moody drum and piano jam, with sinister classical undertones. Others find the guys more or less fooling around, making noises with whatever they can find to do so, and they're an interesting glimpse into the thought processes of Random Touch as they create their unique music. One shot has them creating music from a balloon and a piece of tinfoil! After seeing the videos, I thought that perhaps I ought to rethink the urban vs. rural metaphor. But then again, I believe any artist would like to think that their work is open to numerous interpretations, so I will continue in this because I think their follow up album, The Elegance of Falling has a more rural tone to it. Don't get me wrong. I don't mean that it is more acoustic or folksy or country in that sense. It's still the same compelling, experimental music as always. But this time out the duo invite guitarist Scott Hamill to join them again (as he did on A Parade of Dusty Hobos), and his playing really adds another dimension to Random Touch. On The Elegance of Falling, the music is less planned out, less structured, more organic in nature. That's not to say that there isn't an element of the mechanical or industrial to the sound. There is. Imagine driving along a country road, beneath an overcast sky. Dark thunderclouds murmur on the horizon. You slow down near an ancient barn, its wood grey with age. Beside it rests an old car engine, long ago turned an austere reddish brown with rust. Zoom in on the engine, close enough to see the corroded mechanisms lying still in a gentle wind that blows in from fields of yellow grasses. As it begins to rain, see the water run in rivulets through the machinery, gathering rust as it flows. It's that kind of music. Stark, sharp, menacing, liquid, weary. Again, to use a Fripperism, there's no pussyfooting around the fact that this is very challenging music. But it never dissolves into sheer directionless noise. It's always moving forward, taking chances, leading you onwards into its desolate yet beautiful world of rural decay. In fact, both The You Tomorrow and The Elegance of Falling make a nice pair that accentuate both major facets of the band, and also demonstrate that they are getting better with each recording. 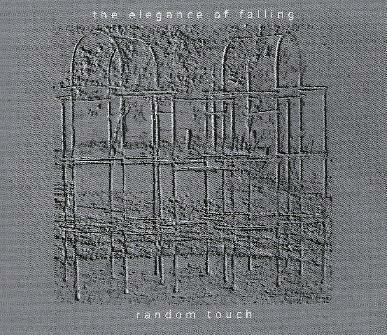 It's a difficult style of music to feel assured in, but Random Touch manage to make it sound easy. If you have a musically adventurous spark in you, you will find much to enjoy on both of these CD's.